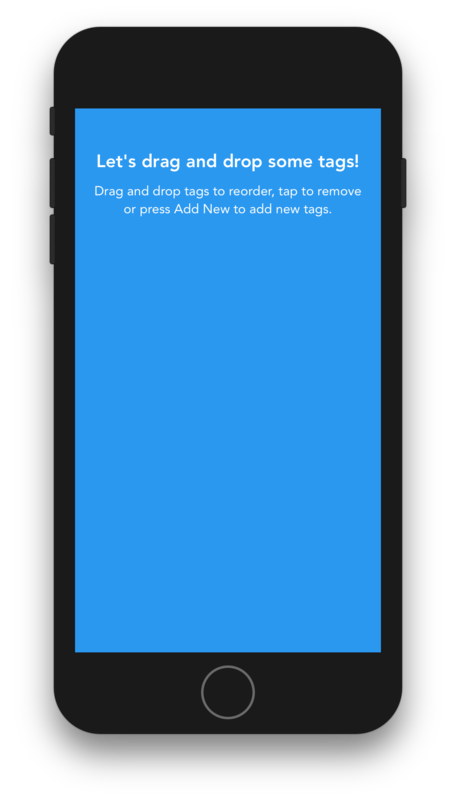 During this series we’ll be working on the app that has a list of tags and allows adding, removing and reordering tags by dragging and dropping them. In this part, we’ll focus on setting up the presentational components to render some tags in a list. And we’ll also add the ability to remove tags from the list by tapping on them. Here’s how the app will look like. Let’s get starting by initializing a new project using create-react-native-app. If you’re not familiar with create-react-native-app check out Building React Native Apps on any Platform without Xcode or Android Studio. Open Terminal and run these commands to initialize a new project. Run npm install -g create-react-native-app in terminal if you don’t have create-react-native-app installed. 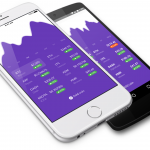 Now there are three options how to run the app during the development process. Then launch Expo app (iOS, Android) on your mobile device and scan the barcode outputted in the terminal. Once you’re done, you should see this screen either in the simulator or on your phone. We’re going to need to install one dependency for the project. react-native-vector-icons for adding those close icons to each tag on the left. Open .flowconfig in project root folder and scroll down to the bottom to find out Flow version. Let’s say it’s 0.49.1. Open package.json file and add "flow": "flow" to the bottom of scripts section after test. Open Terminal and run npm run flow. You should see No errors! message. First of all, let’s create a new folder for all of our source files, so all code is contained in one location for easier navigation around different components we’re about to create. Create a new folder called src within the project root folder. We’ll be creating all new source files and folders within this folder. Let’s start off by scraping the boilerplate code and setting up a basic component with some text and styles instead. 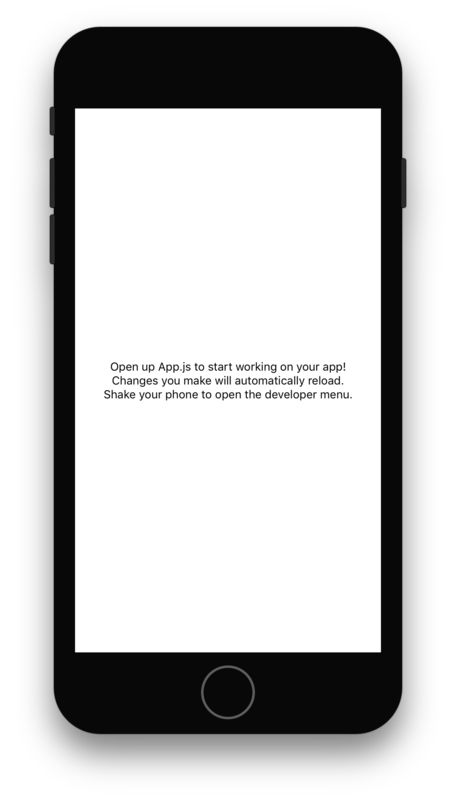 Open App.js file within the project root folder and replace all of the boilerplate code with the following. Let's drag and drop some tags! 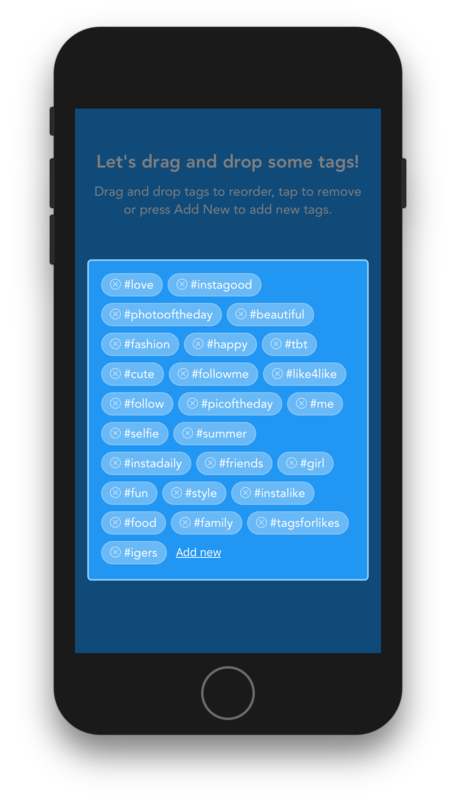 Drag and drop tags to reorder, tap to remove or press Add New to add new tags. Next, let’s start working on Tags component highlighted in the screenshot below. 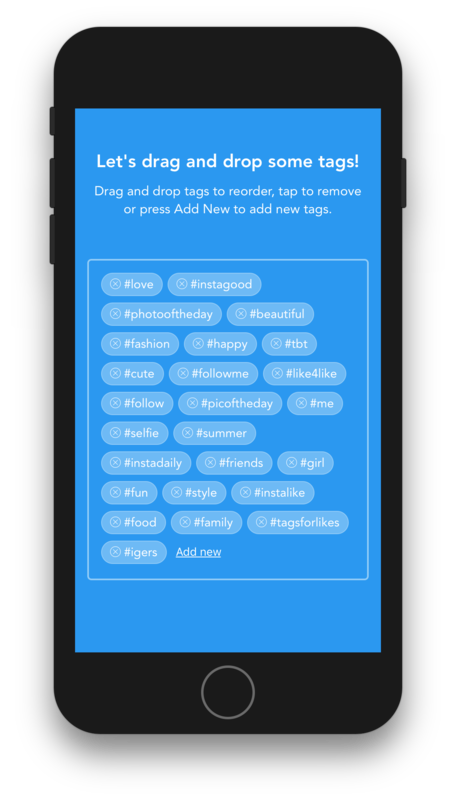 It’s going to be our core component that will handle dragging and dropping, adding and removing tags. In the first steps, we’re going to build basic versions of each component that can only render tags and do nothing else. And after that we’ll be adding more features step by step. Since there’s going to be a lot of drag and drop gesture handling logic and also rendering the list and the tags itself, let’s break it all down into three separate components. Tags. Handles drag and drop gestures using React Native’s PanResponder and each tag position measured by Tag component. TagsArea. Renders each tag passed from Tags component using Tag component. Tag. Renders each tag. This is a simple presentational component, that doesn’t have any logic, except for measuring its position on the screen when re-rendered and passing it up to the parent component TagsArea. Let’s start building these components backward one by one, starting with Tag, then TagsArea and finally, Tags. But before we start working on the components let’s create a file with a couple of types that we’re going to use to type hint our components. Create a new file called types.js within src folder. Now that we have the types defined let’s create a presentational Tag component for rendering each tag. This is a pretty simple component that receives a tag object that has a title to render, and two callback functions. First one is onPress which is called when a user taps on a tag, and the second one is onRender which is called whenever a tag is rendered. The component passes tag coordinates on the screen, and its width and height to onRender callback function, so the parent component knows where each tag is located on the screen at any given moment. Create a new folder called components within src folder to store all component files within that folder. Create a new file called Tag.js within src/components folder. Next, let’s create TagsArea component which is mostly just a layer between Tags and Tag components. It receives tags array and a few callback functions and loops through tags array to render each tag using Tag component that we created in the previous step. And it also adds Add new button after all of the tags. Create a new file called TagsArea.js within src/components folder. Now, let’s create a basic version of Tags component that receives an array of tags which looks like ['tag', 'another-one', 'etc.'] via tags props, converts it to an array of objects to be able to store additional tag props in the state, and passes it down to TagsArea to render those. Create a new file called Tags.js within src/components folder. It’s time to see those components we just created in action. Let’s update App.js to define some tags and render them using Tags component. Open App.js file within the project root folder and add a few lines of code. The lines you need to add are highlighted. And there you go. Now we have a nice list with a bunch of tags. BTW those aren’t just some random tags. Those are the most popular tags on one of the social media platforms. I’m sure you’ve guessed what that platform is by looking at the tags. Now that we’re done with the basic version let’s continue adding features and add an ability to remove tags from the list. Let’s update Tags component, so when you tap on a tag, it gets removed from the list. Open Tags.js file within src/components folder to make a couple of changes. First of all, let’s set up animation so when a tag gets removed from the list the rest of them that follow the removed tag is animated nicely when moving to take the place of the removed tag. That’s when LayoutAnimation comes in handy. Here’s what we’re going to need to do to achieve that. Import LayoutAnimation and configure it in componentWillUpdate to animate any layout changes. Add new prop animationDuration for setting animation duration with the default value of 250. And finally, let’s add a function that removes tags from the state and pass that function to TagsArea component, so it could pass it down to Tag component which will call it whenever you tap on a tag. Add removeTag function which finds a given tag and removes it from the state. Pass this.removeTag function we just added to onPress prop of TagsArea component instead of a blank placeholder function that we currently have. Now, try tapping on tags to remove them and see how nicely they disappear thank to LayoutAnimation. That was easy to set up, wasn’t it? And another great thing about LayoutAnimation is that it’s going to animate tag movements when we add tag reordering feature without any additional code. That’s the beauty of the React Native way. You’ve done a lot so far! 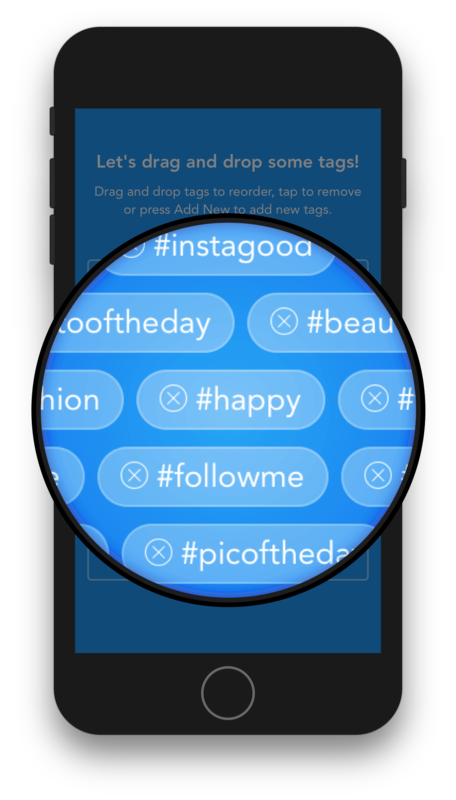 We already have an app that renders tags in a beautiful list and allows removing them. In the next and final part, we’ll implement reordering tags using drag and drop gesture and add a modal with a text input for adding new tags. Subscribe below to get an email when the next part comes out! That’s all I wanna say!